BERLIN --- In the past armament projects were often more expensive and lasted longer than originally planned. Not infrequently, they did not meet all military requirements. With the "Agenda Armament" and the trend in materials and finances, the Ministry of Defence (BMVg) has introduced far-reaching changes to modernize armaments. 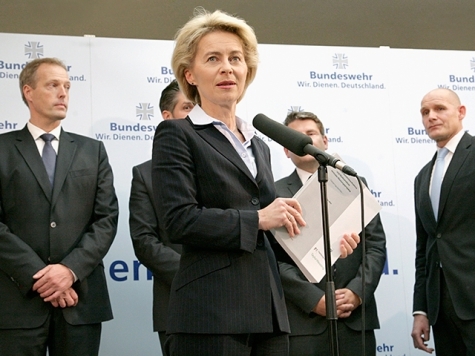 In the summer of 2014, Defense Minister Ursula von der Leyen commissioned an external inventory of the major projects, structures and processes in the field of armaments. The expert opinion of KPMG, the engineering company P3 and the law firm Taylor Wessing showed "from the ministerial point of view" "weak points and need for action". With the "armaments agenda," she drew far-reaching conclusions from the expert's report. -- To create a controllability using a clearly defined code system. Since August 2014, former company consultant Katrin Suder has been responsible for the armaments sector in the BMVg. The Secretary of State was given responsibility for the "Commissioned Strategic Control of Armaments" as well as a project organization to achieve targets such as a new armaments management. A lot has happened since the "Kickoff" event in November 2014. Gradually, status reports were prepared on the major armament projects of the Bundeswehr, in which risks, problem areas and forecasts are documented. Project managers now report directly to the management of the ministry. This is the only way to identify problems at an early stage. "This will save time and money," said von der Leyen, who also favors an open and honest error culture. The management of the BMVg meets every six months to discuss the status reports. The "armor board", chaired by the Minister, includes the state secretaries and the general inspector of the Bundeswehr as well as the responsible department heads and the management of BAAINBw (the MoD’s defense procurement agency—Ed.). The results of the meeting are included in the new "Report of the Federal Ministry of Defense on Armaments Affairs." In addition to the status reports, the report also documents the measures taken by the armament board. Since March 2015, five reports have been published, each divided into an open part and a classified part. They create a new form of information and transparency vis-à-vis Parliament and the public. Armament procurement has been fundamentally changed. The new risk analysis, better reporting, and the clearer structures of responsibility and reporting channels, have had an effect. The report of April 2017 states that "Essential objectives of the Agenda armament have been achieved." A total of 66 projects have now been transformed with a modern risk management system, and have been divided into a number of individual risks in order to react quickly to problems. Industry is also now in a strategic dialogue to provide the armed forces with the necessary equipment at the best possible time, performance and cost frame. In the report, the BMVg speaks of a "continuous change process," which must be steadily continued. In addition to the armaments agenda, great material progress has also been made. In January 2016, the Minister stated that the armed forces will need an investment of about 130 billion euros over the next 15 years. The procurement of equipment has to be more flexible and adapted to the situation and tasks of the Bundeswehr. "We need long-term and reliable financing of the Bundeswehr," according to von der Leyen. The "management of defects" should come to an end, in order to be best-equipped, especially for operations. Thanks to additional financial resources, a common operational picture of the armed forces’ situation as well as many other measures intended to improve equipment availability can be initiated. According to a report by the BMVg in November 2016, the "available inventory" of the 54 main armament systems has improved. However, there is still a need for improvement in the procurement of spare parts and maintenance. Equipment availability depends on the improved financial resources of the troops. The trend of declining defense expenditure has been reversed. Thanks to the new armaments management, available funds can also be used more effectively. Between 2013 and 2017, the defense budget has increased by around four billion euros, to 37 billion euros. The share of defense spending in the gross domestic product is now 1.22 percent. By 2020, the budget is to be further increased to 39.2 billion euros. The Bundeswehr said that this was pushing a "huge modernization," the minister explained. It is about filling hollow structures, replacing old equipment and building new skills. Accordingly, the trend in financials is correspondingly important. Many armament projects cannot be finance and controlled nationally. This is why the BMVg is committed to implementing research and development projects on a bilateral or European level. With France, the Netherlands and Norway there are ongoing cooperations on tactical air transport, the further development of the combat helicopter Tiger and the class 212 submarine. Much is promised by the EU’s PESCO (Permanent Structured Cooperation) initiative, in which interested Member States are able to cooperate more closely and to jointly implement armament projects. The aim is to harmonize the military equipment of the Nations, and make more effective use of the available resources. For Ursula von der Leyen, PESCO and the proposal of a European Defense Fund are important milestones on the road to a European security and defense union.